Henry John Templeman was born in Yeovil around 1848, the son of confectioner Henry Charles John Templeman (b1817) - variously known as Henry or Charles and also by the nickname of 'Temple Bar' - and Jane née Dodge (b1812). In the 1841 census Henry and Jane, with their two young sons Henry and William (b1850), were living in the house of his widowed mother, Mary (b1788), in Belmont - the continuation of Park Street where it joins Hendford. Mary gave her occupation as 'Pauper formerly glover'. In 1860 Henry (presumably Henry Snr) was found guilty of being drunk and disorderly (not for the first, or the last time) and fined ten shillings by the magistrates. In fact I found several newspaper reports from this period when he appeared before the magistrates for the same offence. Henry - better known as "Temple Bar" according to the Western Gazette - was fined a shilling for being drunk and swearing in the street in August 1873. By 1861 the family had moved to Wine Street where Mary was still recorded as the head of the household and Henry senior, recorded as Charles, and Jane now had a third son, Simeon (b 1855). Henry/Charles was now working as a 'Newsvender' as was 11-year old William. 13-year old Henry was working as a leather dresser. 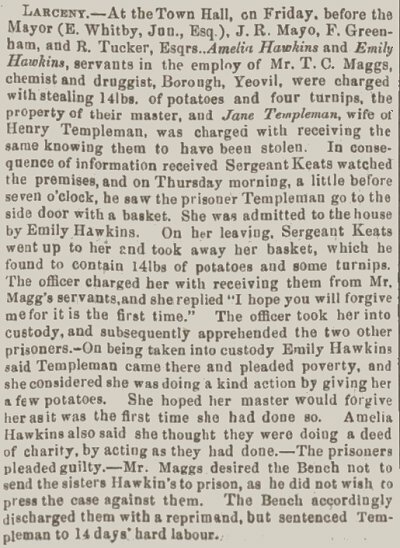 Henry's mother, Jane, in the meantime, had been charged in 1863 with receiving 14lbs of potatoes and four turnips. Found guilty, she was sentenced to fourteen days hard labour (see Gallery below). Not to be outdone, Henry 'Temple Bar' Templeman received fourteen days for being drunk and disorderly in 1865 which, according to the Western Gazette which would "give him an opportunity of reflecting upon the uselessness of profanity, and the majesty of the law". In the spring of 1869, at Yeovil, Henry Jnr married Matilda Elizabeth Abbott (1847-1928), originally from St Peter Port, Guernsey. In the 1871 census they were recorded living in Park Street where Henry gave his occupation as a hawker and Matilda listed hers as a straw bonnet maker. During the next decade Henry and Matilda moved to 10 Sherborne Road where Henry opened a shop as a grocer. They had one son, John William (1879-1948). The family were still recorded, living above the grocery at 10 Sherborne Road, in the 1891 census. It was not all plain sailing for in November 1892 Henry was summoned "for selling bread otherwise than by weight.... loaf, two ounces and six drachms short". In fairness, six other Yeovil grocers were all found guilty of selling underweight loaves at the same assizes. They were each fined 2s 6d with the costs to be divided equally. The 1901 census recorded the family, together with Matilda's mother Mary Ann Abbott (b1823, originally from Crewkerne), at 15 Sherborne Road (I don't know if they moved a few doors along the road but it is more likely that No 10 was re-numbered to No 15). By this time Henry gave his occupation as 'Outfitter & Shopkeeper' while his son gave his as 'Hatter & Hosier'. John William married Anne Eliza Lowe at Yeovil in the spring of 1902. They were to have three children; Harry John (b1903), Myrtle Annie (b1905) and another son G.E. (born after 1911 and who I've not managed to trace). John initially set himself up as an Outfitter and was recorded in Whitby's Yeovil Almanack Advertiser of 1903 as having a shop at 36 Middle Street. By 1907 however he had moved to his father's shop in Sherborne Road (see Gallery below) almost opposite Osborne House and was listed as a Hosier in Collins' Yeovil Directory of that year. By the time of the 1911 census Henry had retired and was living with Matilda at 34 Sherborne Road. He gave his occupation as 'Retired Grocer'. John and Anne, together with Harry and Myrtle and 15-year old outfitter's apprentice Samuel Pearcy, were living above the outfitter's shop at 15 Sherborne Road where John gave his occupation as "Gentleman's Outfitter (Shopkeeper)". Henry Templeman died in Yeovil in early 1919 aged 71 and Matilda died in Yeovil in the winter of 1928 aged 81. John continued running the outfitter's business and was joined by his son Harry. In 1935 Kelly's Directory listed Templeman & Son as "Outfitters, etc. of 13,15 Sherborne Road". However during the 1920s the business shifted its main emphasis to footwear. John had no space to store his shop car, so he bought Jubilee Terrace in Eastland Road so that he could store the car in the adjoining garage. In the 1940s another footwear shop was opened in Hendford, opposite the Three Choughs Hotel, managed by his son Harry who also managed a branch of the store in Weymouth, Dorset, while his younger son, G.E. (I only know the initials) managed the premises in Sherborne Road, listed as "Templeman's, Tailors of Sherborne Road" in Edwin Snell's Directory of 1954. In late 1961 or early 1962, Templeman's moved to new premises in Bond Street (see Gallery). John Templeman died in Yeovil in early 1948 aged 69 and his obituary is shown below. The report on Jane Templeman's charge of receiving from the 13 January 1863 edition of the Western Flying Post. Not to be outdone, Henry 'Temple Bar' Templeman received fourteen days for being drunk and disorderly yet again as reported in the 29 August 1865 edition of the Western Gazette. 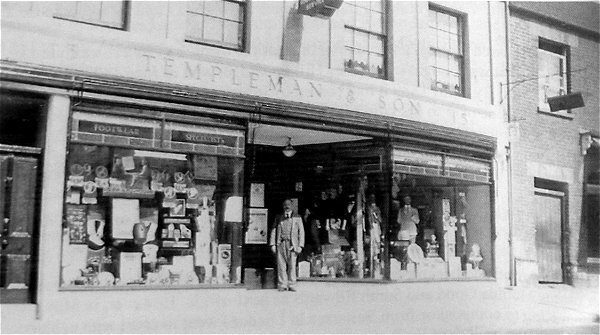 I don't know when this photograph of John Templeman's shop was taken - it looks to me like it was taken during the 1920s or 1930s. .... but this photograph was taken in 2016 from the car park alongside Osborne House. 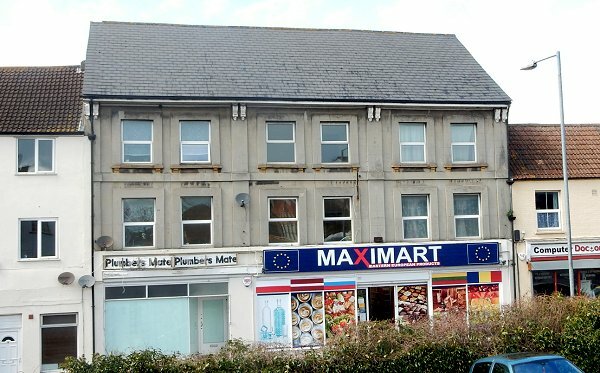 The former Templeman's shop is now occupied by Maximart. The obituary of John Templeman from the 5 March 1948 edition of the Western Gazette. An advertisement from the Yeovil Town Football Club programme of 10 March 1962, with Templeman's "Now At Bond Street".